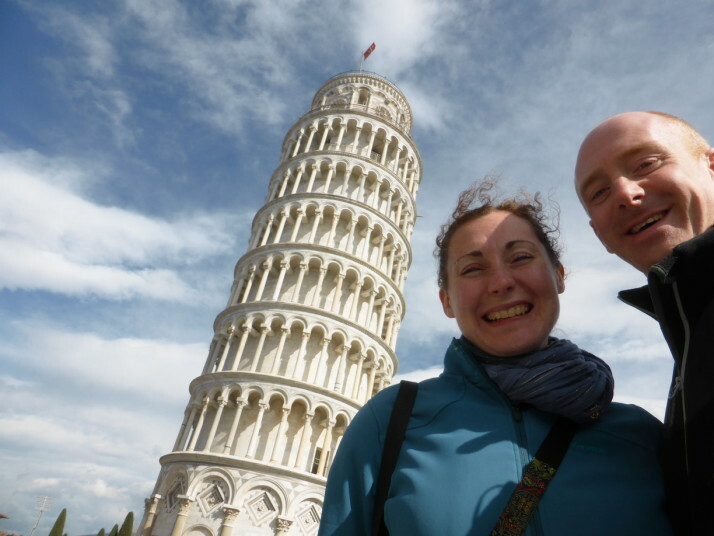 We’d only planned a few days in Florence, and one of the main reasons for breaking up our journey through Italy en-route to Switzerland was the easy day-trip to Pisa, the local trains are frequent and take about an hour from the central Firenze SMN station to Pisa Centrale. Us with the famous leaning tower of Pisa! 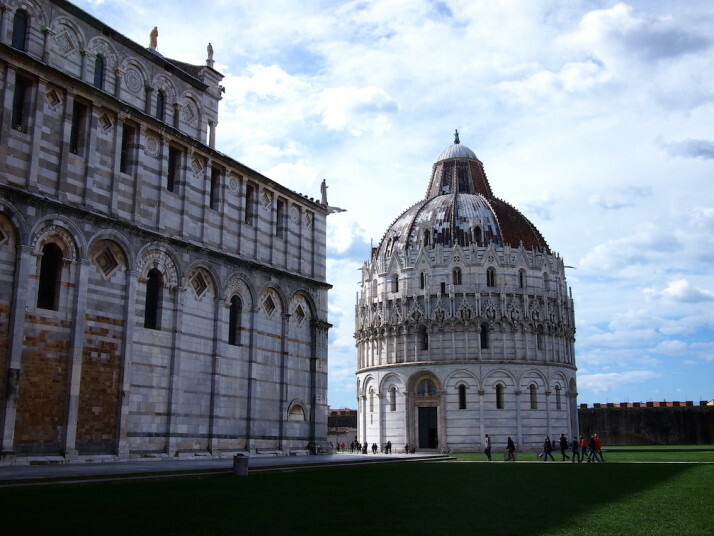 Situated at the mouth of the River Arno – the same river that flows through Florence – Pisa has a long history of education and is still a very prestigious place to study. It’s also the birthplace of the famous physicist, mathematician, engineer, astronomer, and philosopher Galileo Galilei. 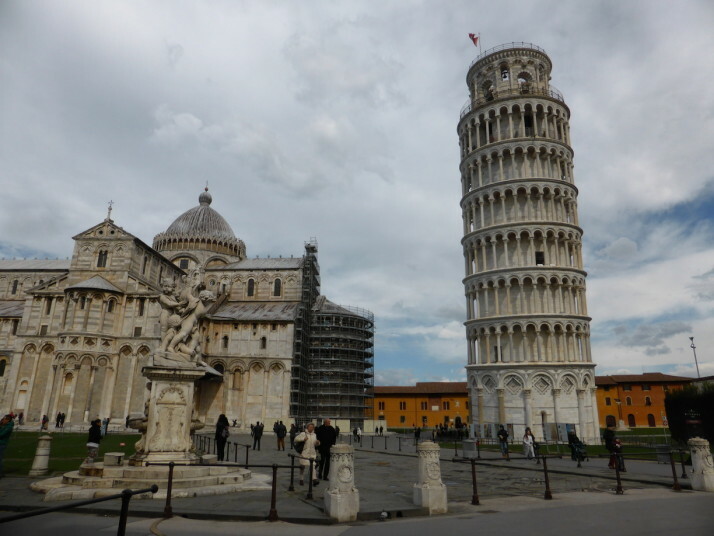 Arriving in Pisa, we headed straight for the wonderfully named Piazza dei Miracoli – literally Square or Plaza of Miracles – the location of the town’s cathedral, baptistry, cemetery and of course, the world famous leaning bell tower of Pisa. Climbing the tower is by allocated time slot, and thankfully we only had to wait 10 minutes. 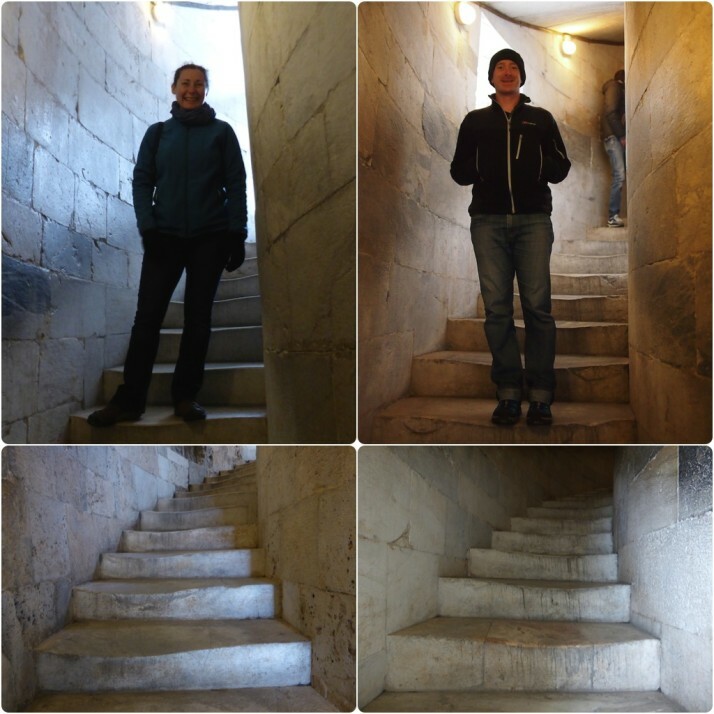 The tour started with a seat in the main central atrium where we were given a quick but comprehensive history of the tower (in English and Italian) before we were shown the stairs to start our ascent. 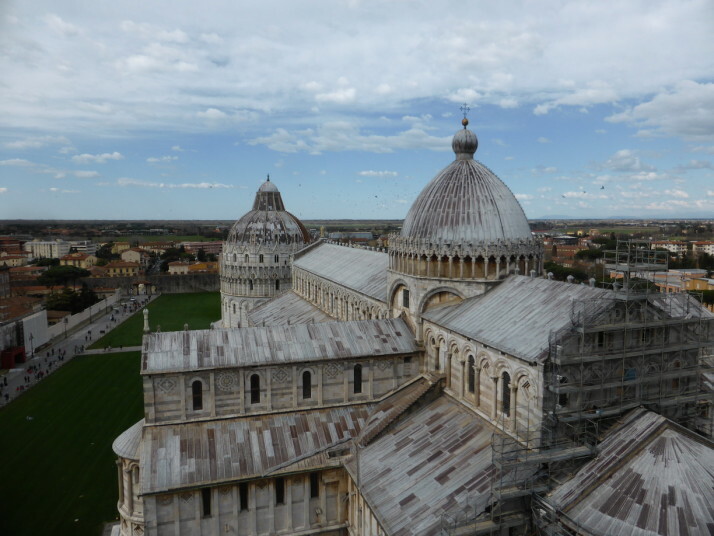 The view from the top of the Piazza and Pisa was well worth the climb. The strong, cold winds reminded us of the first bell tower we climbed in Riga at the start of our trip almost two years ago! 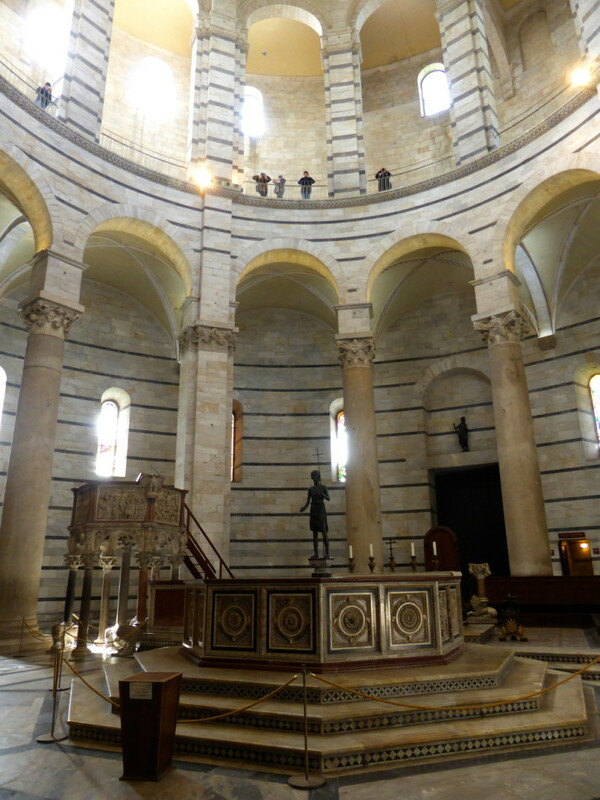 After a quick spot of lunch we did the second thing that you have to do when visiting Pisa..
Just like the layout in Florence, Pisa’s Baptistry faces the main doors and is circular. 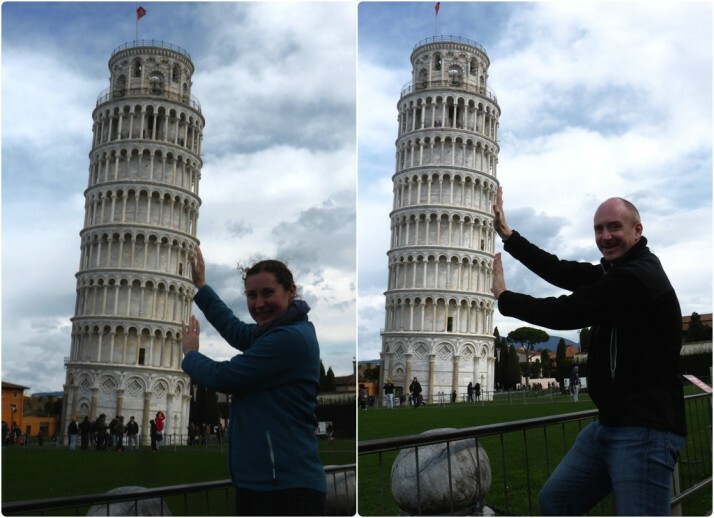 It’s the largest in Italy and it’s also just a few centimetres taller than the leaning tower! 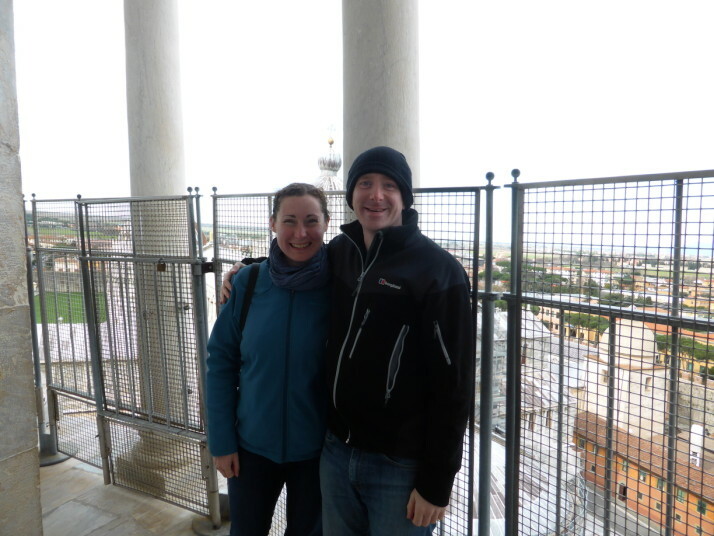 Next up we headed to the other end of the Duomo to visit the Baptistry. We really liked its half-Roman, half-ornate-Gothic exterior, and we were surprised we were able to go up into the 1st floor gallery inside. It has wonderful acoustics – the guard closes the door every half hour, stands in the middle of the room and sings a few notes that resonate for so long that he could create chords with his own voice! 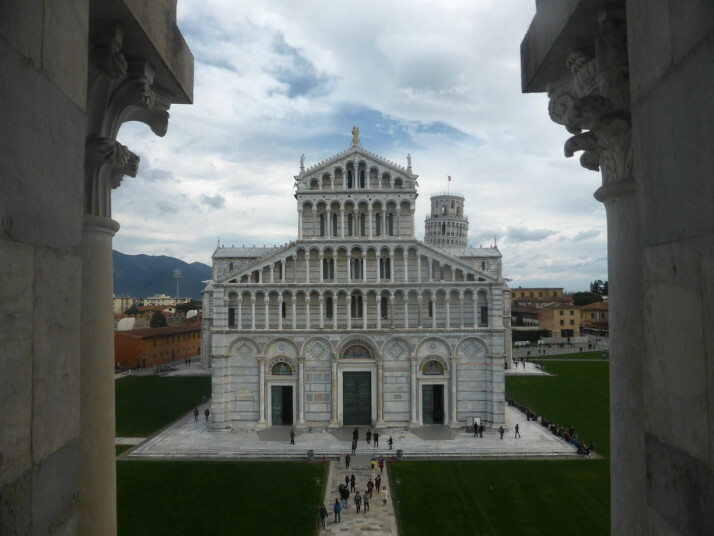 The central building of the Plaza of Miracles is the Pisa Cathedral. 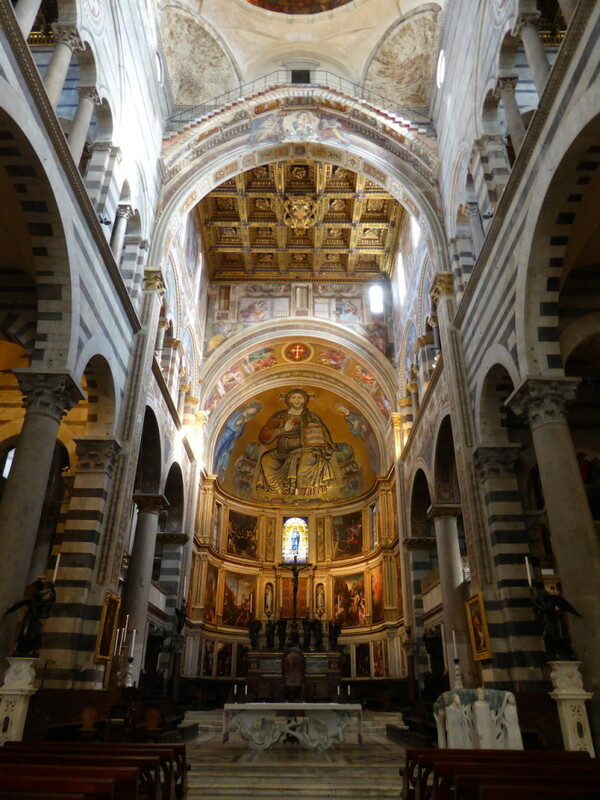 Started in 1064, inside it’s bright and airy and reminded us of Cefalù in Sicily, not least because the apse is filled with a similar Christ Pantocrator in beautiful gold mosaic. It also contains a pulpit that was sculpted between 1255-1260 by Giovanni Pisano – the classical style of the carving and sculpture is considered to be start of the Italian Renaissance (1260). 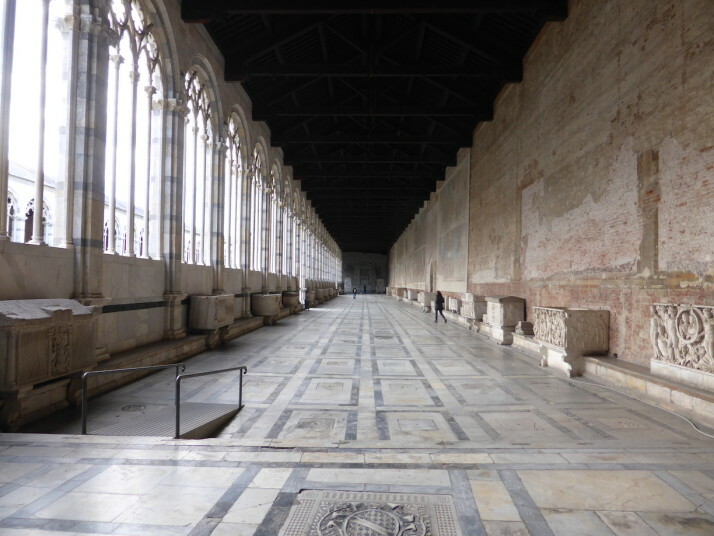 The last building of the Square of Miracles we visited was the Camposanto Monumentale, or Monumental Cemetery. It’s a massive Gothic cloister full of tombs. The floor is covered in worn out gravestones, sarcophagi line up along the lower walls and above them are the remains of giant frescos that were largely lost due to a fire in World War II. It was very peaceful with few visitors and we loved the long corridors. 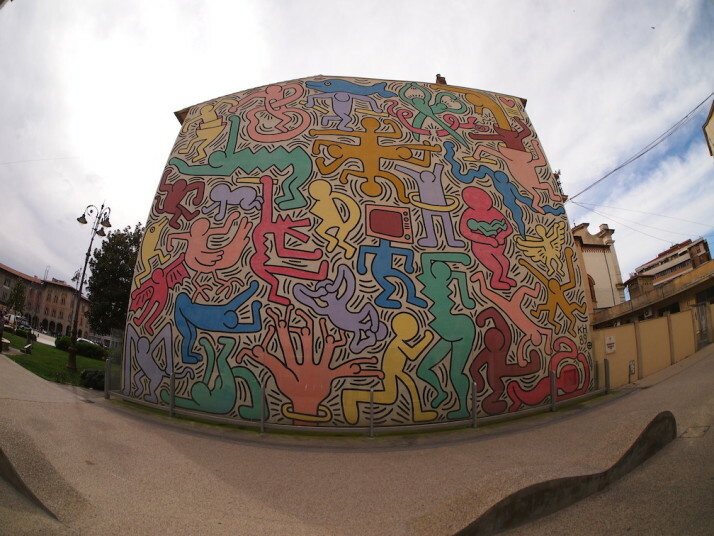 Just a block away from the train station is the last mural by Keith Haring called “Tuttomondo” (All world), painted on the side of the S. Antonio Church buildings in 1989. We instantly recognised his simple stylised characters though we didn’t know the artist or that this was his last public work. Pisa is a great little city. We were really surprised how ornate the leaning tower is, and that because it started leaning early in its construction, subsequent levels where built smaller on one side to try and correct the lean which means it could be more accurately described as the leaning banana tower of Pisa! 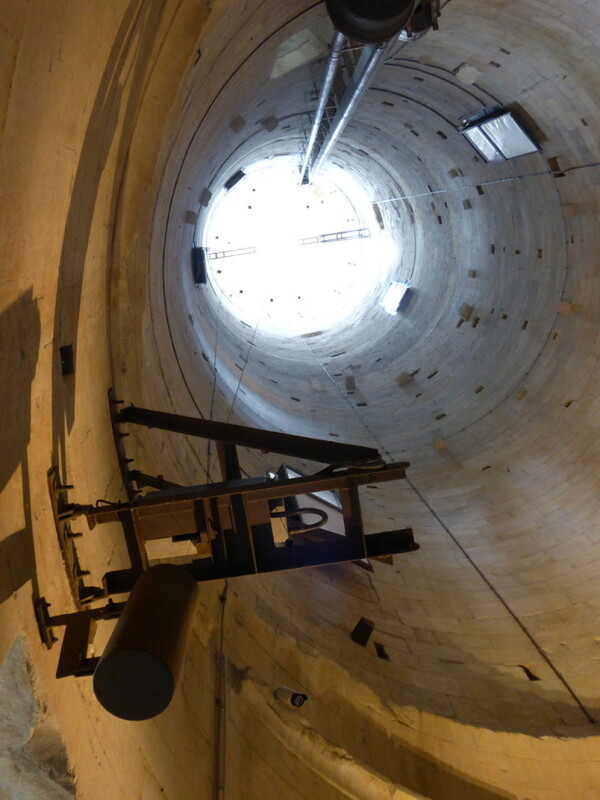 This entry was posted in Places and tagged Architecture, Church, Italy, modern art, Pisa on March 17, 2015 by Andrew.